It must be cold outside or something because all I have wanted as of late is the kind of grub that sticks to your ribs and sends you into a food cocoon for hours. It’s an odd sensation for a girl who hates feeling weighted down after a meal, and yet, salad has seemed an insult to freezing fingers and chapped lips, thin soups a cry for help and even my favorite dumplings have seemed too bright and springy this week. Go away, you peppy foods, I declare, and don’t come back until I can feel my toes. Saturday morning I made another of those frittatas I’d mentioned a couple weeks back, hoping those potatoes, bacon and eggs with a toasted English muffin would make the icy breeze in Brooklyn less cruel and unforgivable, but no dice. (Though we loved it, despite all that, and I encourage you to design your own favorite frittata with on-hand ingredients.) We returned in the evening with intent make a reservation at whichever fireplace-d and cozy restaurant would take us but when first through fourth choices failed to see our charms, we started reminiscing about that three-bean chili I used to make with cheddar-jalapeno cornbread and suddenly, the idea of smarting up and going to a restaurant seemed utterly ridiculous. Go out? But why? We stayed in, spiced up and let Jennifer Hudson croon a hole in our speakers with a top-secret copy of Dreamgirls, happy as clams. Having learned my lesson leaving the apartment to, like, do things on Saturday and being rewarded with only a frosty nose, I fought it tooth-and-nail on Sunday, going back to bed twice after waking up because climbing into a tangle of heavy blankets is simply the best sensation on earth and I’ve resolved to not limit this joy to just once a day anymore. At 3 p.m., we finally rolled out, but only to hit the gym and the Hellmouth that is Whole Foods before friends came over at 8. I scrambled a bit, short on time when we got home, tearing casings off sausages, chopping everything haphazardly, cranking out thick ribbons of varying-width pappardelle, calling instructions to my sous-chef and not measuring a whole lot but thankfully, big ragus are less of a set recipe and more of a suggestion, I think. Or so it was last night. This recipe makes a shocking amount of food — with the pasta, our 7.5 quart Cocotte was filled nearly to the brim — made doubly scary by the fact that even half a bowl could make you so full, you’d swear off food for good. Or, at least until the grapefruit cake came out. We keep a special compartment in our bellies (though I believe mine is closer to my arse) that allows us to be too gutted for another speck of dinner but a wee slice of cake, if you insist, knows just where to go. I consider it a gift. Stuffed to our very gills with crumbled sausage and thick peels of pasta, the oddest sensation came over us — Warmth! Glorious warmth! — and though it might be just that they’ve finally turned up the heat in our building, I’d rather think it’s the rib-sticking grub. Heat vegetable oil in a large pot, adding diced onion and sauteing until browned. Add beans, tomatoes, water or stock and spices, including cocoa, all at once, letting mixture simmer for about 30 minutes, stirring occasionally. 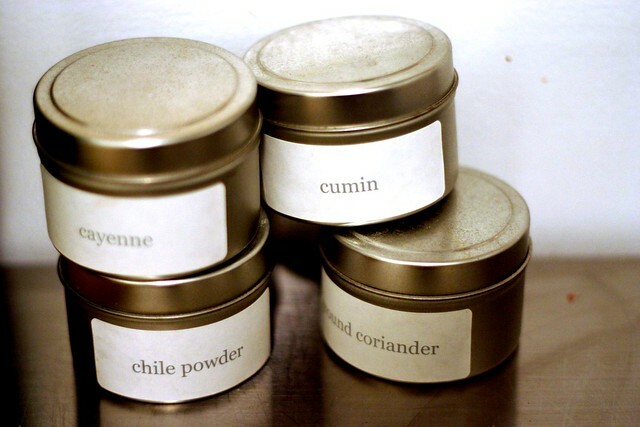 Adjust seasonings to taste. 1. Preheat the oven to 375 degrees. 2. If you are using buttermilk, milk or yogurt, ignore this step. If you want to use soured milk (a good substitute for buttermilk), warm the milk gently — one minute in the microwave is sufficient, just enough to take the chill off — and add the vinegar. Let it rest while you prepare the other ingredients. 3. Place the fat in a medium oven-proof skillet or in an 8-inch square baking pan over medium heat (Deb note: would you believe I lack both? 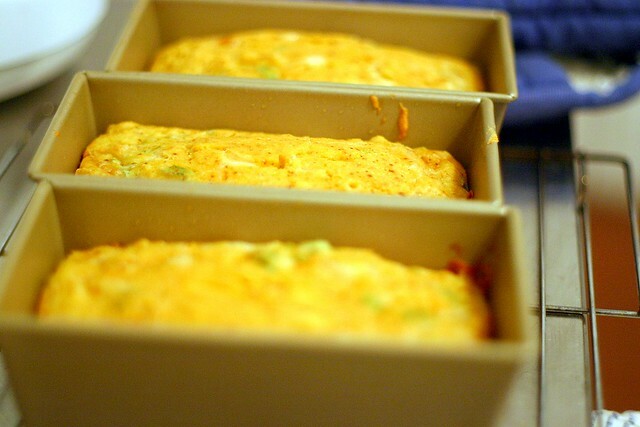 I used three of my mini-loaf pans); heat until good and hot, about 2 minutes, then turn off the heat. Meanwhile, combine the dry ingredients in a bowl. Mix the egg into the buttermilk, milk or soured milk. Stir the liquid mixture into the dry ingredients, combining well; if it seems too dry, add another tablespoon or two of milk. Pour the batter into the preheated fat, smooth out the top if necessary, and place in the oven. 4. Bake about 30 minutes, or until the top is lightly brown and the sides have pulled away from the pan; a toothpick inserted into the center will come out clean. Serve hot or warm. Optional additions I used: One cup canned creamed corn, one cup grated extra-sharp cheddar, two thinly sliced scallions, and 1 tablespoon chili powder, but only because the store was out of jalapenos. I usually mince one in. Optional additions I didn’t use: 1 tablespoon cumin (instead of chili powder); 1 cup fresh corn (instead of creamed); molasses or honey, in place of the sugar, about 1/4 cup; minced herbs such as cilantro or fresh parsley, 2 tablespoons; sautéed onions, shallots or leeks, about 1/2 cup. Makes (at least) 8 servings. Cook pasta in large pot of boiling salted water until tender but still firm to bite, stirring occasionally. Drain well; return to pot. Pour sauce over pasta; toss to coat. Add 1/2 cup cheese and 1/2 cup basil; toss to combine. Season with salt and pepper. Transfer pasta to serving dish. Serve, passing remaining cheese separately. 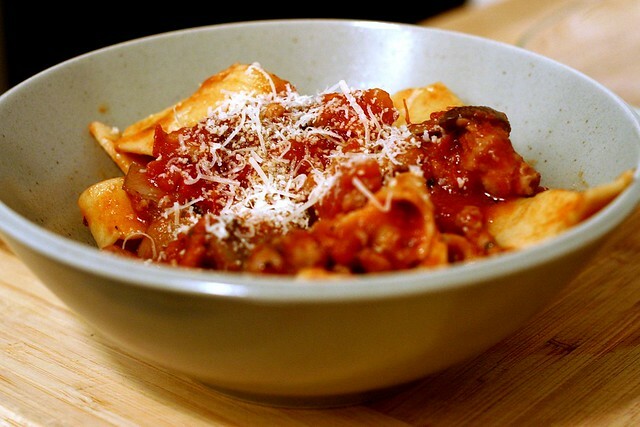 * I made pappardelle with my now-standard pasta recipe, cranking it out to level 5 thinness, which may have in the end been a little thick, but held up well in the hearty sauce. I cut it by hand into wide, completely uneven strips with a ravioli wheel. It cooked in about 6 minutes. Mmm, cold outside, warm food inside. You were busy getting well-fed this weekend, food sounds great. That looks very rib sticking and delicious. Oh, corn bread, how my stomach yearns for thee. Oh, that looks fantastic! I think I’ll have to give both recipes a try the next time I have a weekend off! There was a recipe for corn bread in Food and Wine magazine (January i think?). Have you tried that one? My husband did, forgoing the cast iron skillet in favor of loaf pans because we don’t have one. We both agreed it was good, but would have benefited from a jalapeÃƒÂ±o or two. Tara — I should check it out. What I really, really want is just good, basic stuff, and I know part of what I’m missing is that 8-inch cast iron skillet I’m too lazy to lug 5 blocks home. I put that extra stuff in to kow-tow to the excitable tastes around me, but I’ll know I have the right recipe when it’s perfect — not too sweet, not too fluffy, not too dry, not too greasy — by itself. It can always be doctored up later. That cornbread recipe sounds amazing! I’ll have to try it with my chili recipe next week (we do it up carnivore style with 2 pounds of beef in each poti). I am a huge fan of that Bon Appetit pasta recipe. I am a little afraid of making my own pasta but even with store bought, the sauce is so yummy! My husband makes his own gnocchi which is completely the wrong shape for the recipe but it when you chop everything small, it makes for the great little bowl of bite-sized goodnesses. Oh yeah, papparedelle! I just made the stracotto — pot roast pasta — from the Silver Palate Basics cookbook tonight, with a big pot of pappardelle to go with. And I was thinking how much I love big bulky pasta. I’m a pastahead in general, and I really do think the bigger the better. I really need to try making my own. i will defnitely try the three-beans chili recipe along with the cornbread! it looks so good! thanks for your delicious ideas!!! Deb, I’m planning a Super Bowl party and was considering making chili and cornbread. Thank you! Mmmm, this looks wonderful. I especially like the true-cornbread cornbread. So many receipes wimp out and add quite a bit of flour to make the cornbread more bread-like. This looks wonderful – I’d definitely like to try it! On another note: my favorite boxed cornbread is trader joe’s corbread. Normally I shy away from manufactured foods, but their cornbread is so darn good thta I can’t even remember the last time I made it by hand. I usually doctor it up with fresh corn and a chopped jalepeno. Anyway, this looks delicious! Thanks for the great recipe, as usual! Jessie — I have this terrific fear that people will try this cornbread recipe (I, uh, did provide it) and not love it. It’s not bad cornbread, but as I mentioned above, I think it stands for a little improvement. It’s a “this will do” recipe and not a “I will laminate and frame this.” I might sound a little neurotic (you think?! ), it’s just really, really important to me that the recipes I proclaim will transcend, actually do. [Breathe.] Let me know what you think! Lisa — I had dreamed of ribbons even wider for this, nutcase that I am, but held back in the end. It’s rare that I think they work (ugh, I one got one at a restaurant with the flimsiest sauce, just didn’t work) as well as it does with this big, gut-busting ragu. Ashley, Susan, Lydia — Thank you. Rachael — Trader Joes, you say? Perhaps I shall find out, when and if I ever get to that store that is, oh, less than 15 blocks away. I need to find my cornbread ideal, anyhow, before I can create it at home. I’m up for the make-your-own fritatta challenge! I’ll have to try that this weekend. I participated in Leftover Tuesdays this week and it was fun to randomly pull things out of the fridge and pantry and mix things that I normally would not. You crack me up! I too love to crawl back in bed. It’s one of the best things in the world. That corn bread looks SO good. I just made some for the first time but mine was cornbread with green onions and it was delish. I would like to echo the Trader Joe’s cornbread endorsement. I dont feel the need to ever make it from scratch again, that’s how good TJ’s is. It comes with little chunks of corn in it already, yummy. I am loving your blog and can’t wait to try more of your recipes (or recommended recipes). I made pizza from your pizza dough recipe with my 4 year old this weekend, with great success. And oh, my. The World Peace cookies. That little space in your stomach where you can always fit a slice of cake even if you don’t have room for any more dessert? Leave it to the japanese to come up with a name for it – “betsu-bara” which literally means “separate stomach.” Whenever I go out with my Japanese girlfriends and we have eaten way too much food before moving on to the chocolate course we always pat our stomachs and say “betsu-bara” with a wink. There is always room for dessert, you’ve got a whole second stomach dedicated to it! There are those lovely little spice containers again. Love them! I so want to see Dreamgirls. I’m jealous of your top secret copy as I don’t think I’ll be seeing it until it comes out on DVD for the not so lucky folk. Your comfort food looks just that… so comforting! You know, Deb, there are plenty of times when good enough is good enough. Every meal doesn’t have to be four-star, especially on a cold day and in good company. Sometimes I think people are scared away from cooking for this very reason. For years, it would freak me out when my wife would blithely try a new recipe on company. Me, I wanted something I could make in my sleep, something I’d done a dozen times. But at some point, you have to be confident in your own abilities and just say , “This sounds interesting–I think I’ll try it.” Sometimes it will only be okay. To you, at least–you’ll be refining the recipe in your head even as you serve it. Sometimes, it will be transcendent. But every time, it will be good and filling and satisfying to your guests at your table. That’s how my mom makes cornbread, though I think she uses sour cream instead of cheese. It’s fabulous. And she gets the crust extsa crispy by warming the pan in the oven before putting in the batter. What a beautiful (and useful) blog! Great photos, and then recipes to do them justice. I will link to your blog because in encouraging readers to experiment with food, yours is exactly the kind of site I would recommend. I will definitely try the 3 bean chili- something like a dish I make but the added dimension of the cocoa sounds great! This cornbread looks incredible! I wish I had found this recipe before I made chili for the super bowl — it would have been perfect. Ah well, next year. Go Giants! Deb: I had to laugh, we are FREEZING here in Seattle, everyone repeatedly shocked by our notorious cloud-cover and drizzle that seems to eat away year after year at the already too short summer. Where oh where is that sun? So someone sent me a comic strip, where the guy says: what is the best sunblock you have? And the guy says: try this. And he says: what is it? The answer: directions to Seattle (sub Brooklyn for you:))). i have been on the quest for the perfect vegetarian chili for some time now. and it ALWAYS lacks depth. this chili is DELICIOUS! i am thrilled. i just made it, it is simmering, i tasted it, and i cannot wait for it to finish simmering. the cocoa powder makes it so so good. thanks for posting this recipe! I really get a total kick on how you wrote your stories here on this website. Quick entertaining. Being Southern, I like cornbread without flour, or with very little flour. If it isn’t grainy, it isn’t cornbread to me. Which isn’t to say I won’t eat breads that have a significant portion of flour, because I will. I just won’t consider them cornbread. However, this recipe looks like a reasonable compromise, and I will definitely try it sometime. I make a similar recipe with jalapenos, cheddar, and Mexi-corn. The bell peppers in the Mexi-corn add an additional layer of sweet-flavorful to the dish. I also add paprika, which is probably my favorite spice. Cast iron is the only way to cook cornbread, in my opinion. I heat the oil in the skillet while the oven is preheating, and it makes the crust so amazingly crispy and delicious! just for the record – i love this chili recipe. really. y’all should definitely try it. the adobo chili does wonders to the flavor. it’s also insanely easy to make – dump everything in at the same time. this has become a regular staple in our apt. I made the chili tonight with as written but with one pound of ground turkey. It’s SOOO good. Thanks! I made an egg-free cornbread from elsewhere, since we’re out of eggs. Made the cornbread with 1/2 cup cheddar, a small can of corn kernels, 1/2 fresh jalapeno, and cumin. Was delicious! Ate it with homemade chili (no recipe really, but used yours as guidance). Thanks again for wonderful food ideas! Congratulations on this post being nominated by Saveur! This is a great blog and I’m glad to see it recognized. WOW. I just made the chili a few days ago, and this pasta tonight. it was absolutely scrumptious! i did substitute spicy chicken sausage (as you partially did) and roughly made about 2/3 of this recipe and it was a LOT (there are only 2 of us, though we do have ravenous appetites). so. delicious. the only problem I had was that the sauce had trouble sticking to my pappardelle. is there another pasta you might suggest? and the chili was completely divine. thank you thank you thank you for blessing my little home with so much good food in one week! both the chili and the pasta were the best in their respective categories to date in my household!! Congrats on your win for Saveur’s 1st Annual blog awards for best individual post for this post – and for best food photography! You should be very proud. I follow you but rarely comment. Congratulations!! Great job on Saveur’s blogging award. Keep up the great work. Congrats on not just one, but two, of Saveur’s food blog awards! Your beautiful work: photos, recipes, and writing, deserves recognition. Let me echo congratulations on the Saveur recognition. This post had me living the day and cooking with you. Simply excellent writing. What a great post! Well deserved! I love reading your blog but have never commented before. For great cornbread, you might want to google ronni lundy’s “real cornbread” recipe. This just might be the cornbread recipe you’re looking for. I think you would love her cookbooks also–In Praise of Tomatoes, Butter Beans to Blackberries, and Shuck Beans, Stack Cakes and Honest Fried Chicken. I would love to try it, thanks for the tip. Seriously, I have endless patience for testing out cornbread recipes. I can’t wait to find The One. That sounds like the perfect cozy winter day! Hey Deb, I just wanted to post to say that I made this chili last night and it was absolutely delicious. So good! While it was cooking I was a little worried that it was going to be way too thin, but after sitting off the heat for a few minutes it thickened just right. I’m looking forward to eating leftovers for lunch today. Thank you so much! Cornbread cooked unevenly in square pan. Will try shallow round pan next time. Otherwise, tasty with soup. chili is awesome. I only made minor adjustments – more chillies, added high protein tofu (cut in 1/2 inch cubes) and some Qourn fake meat grounds. It freezes really well. I don’t know if y’all have tried Cook’s recipe for Cornbread, but it strikes a nice balance between north and south. As a Yank living in Virginia, its my personal favorite. Hi Deb, A friend linked your recipe to blueberry muffins on Facebook and, in the past week, I’ve tried at least 7 of your recipes. I think I’m addicted, but no one seems to be complaining! I made the 3 bean chili and (a version of) the corn bread (I ran out of cornmeal, so I had to substitute some flour – turned out pretty well) and the best coco brownies for the superbowl. Just wanted to share heartfelt appreciation the time you put into this!! 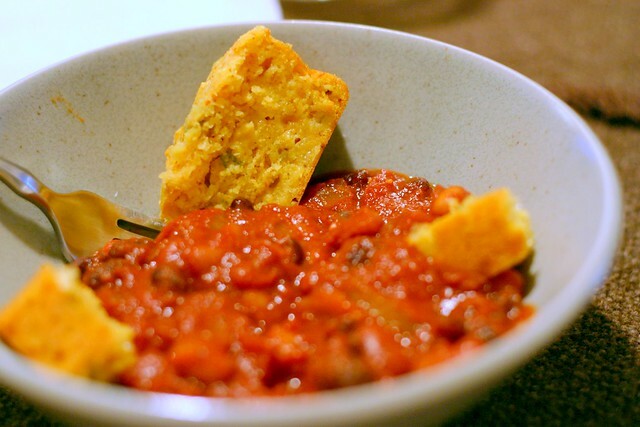 Just coming over here to say that I made the three-bean chili and cornbread for the Super Bowl, too. I added a chopped green pepper and served it with avocado slices on top. Delicious! Deb, is there anything I can substitute for the white wine? The pasta is perfect, but since my family doesn’t drink or buy alcohol, I don’t know whether it is really all that important. I love your blog! Just made this chili for my family (it is an unseasonably cold day in Kansas City) and it was a hit. The cornbread? Not so much. I tried your cheddar, chili, scallion version and wish I had stuck with plain ol’ slightly sweet corn bread. Just my two cents. What is the photo of at the top of this page – looks like something with spinach and potatoes and looks absolutely lovely – what is it and is the recipe somewhere else on the blog? Thanks! colleen — Sorry, I think it was just a “dump-it” recipe. There’s a link in the second paragraph on “frittata” to this post, where I roughly describe this potato/spinach one. I was terribly skeptical about 3 bean chili because I’m not generally a chili fan (or a pinto bean fan). But I made this up (sans chipolte) because I needed a frugal meal featuring tomatoes, and was glad I did. It was pleasantly spicy without being hot and all the flavors were well balanced. I added one diced yellow bell pepper because it needed eating, and I also threw everything in the crockpot to heat up instead of using a pot because it seemed like the thing to do. I love that it’s vegetarian; it’s so tasty and filling you don’t even notice there’s no meat. I just made the chilli (with ground veal) and com bread. I’m still salivating thinking of it and I can’t wait for leftovers tomorrow. I’ve never commented on your recipes before but I pretty much use your site exclusively when I cook or bake and you are a big reason everyone thinks I’m such a good cool- so THANK YOU! I made the cornbread as written with a can of creamed corn and I thought it was ok, not great. I’m still seeking a good, fast cornbread recipe. I also made the chili, and that was very good. I second Lola’s comment (#53) – the pasta recipe looks great, but do you know of anything that could be substituted for the white wine? Or could it simply be omitted? Did the chili and the cornbread last night, and both were amazing. Notably, my lovely boyfriend, who likes neither chili nor cornbread, can’t stop eating either of them. This chili is the perfect hibernation fare. I’ve made it several times this year; it’s a go-to meal now in our house! Deb–I’m forced to disagree with you, this isn’t a chili recipe. Real chili contains beef and no beans. Made three bean chili last night and it was Excellent. Squished whole plum tomatoes and being out of chipotle used about a teaspoon or more of cayenne. The spice mixture was just right. Definite keeper! For Corn muffins, I used Edna Lewis corn bread(NYTimes), which is my favorite with no flour or sugar; but is moist and delicious. If you try it, let me know.